Hooray, this beautiful girl from one of our new orphanage partnerships has a family that is working towards bringing her home Forever! We are so happy for her and her new Forever Family, and we can’t wait to see them come home! As a younger child with very minor needs her file was considered LID, meaning her family had to have their paperwork logged in before they could be matched with her. Our China LID track is a great program for families that are drawn towards adopting from China, yet feel that a Special Focus child may not be the best fit. 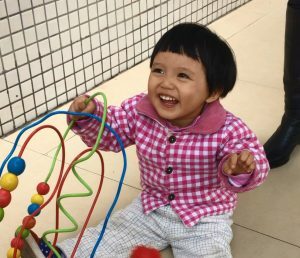 Since we receive most of our LID files from our orphanage partnerships, we are looking forward to seeing this program continue to grow as we partner with more and more orphanages across China. If your family is interested in learning how you can begin your journey towards being matched with a child through the LID track, contact our China matching specialists today!